Burglars fear detection alarm system. No police calling residential alarm urban neighborhood security system. This wireless alarm security solution includes 1 exterior solar powered wireless burglars detector, high decible audio alarm with red flashing light, 2 key-fob to remote control the siren strobe. 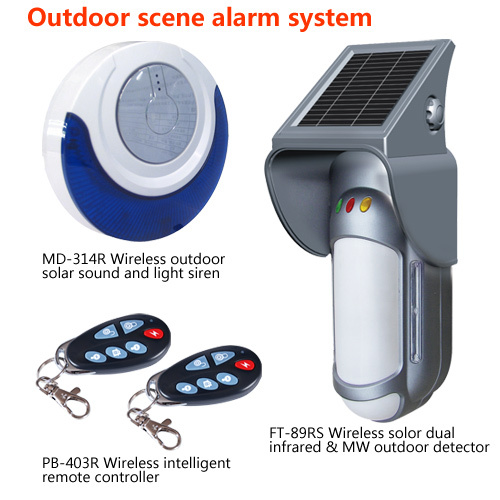 As pictures showed, this sales leading package includes 1 pc FC-89SR solar powered wireless exterior intruder detector, 1 pc MD-214R wireless siren strobe, 2 pcs key-fob to de-activate the siren strobe alarm. 1.It is with one emergency button and 2 appliance control buttons. 2.It is used to arm (with home arm and away arm mode), disarm the alarm system. 3.Exquisite design, with pictures for key functions easy explain. 4.Scientific address code with millions of combination which enable all the remoter controller to be exclusive one, without permitting, it is impossible to copy. 5.Low consumption for transmitting, indication for signal output. 8.Voltage:5.8V-7V, (using 2pcs CR2032 Lithium batteries) about one year working life.